Bride groom Prince Harry (properly His Royal Highness Prince Henry of Wales KCVO) is well known for his charitable work worldwide. 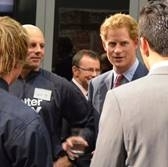 It is little wonder that ShelterBox caught his eye for Royal briefings and a Royal premiere. 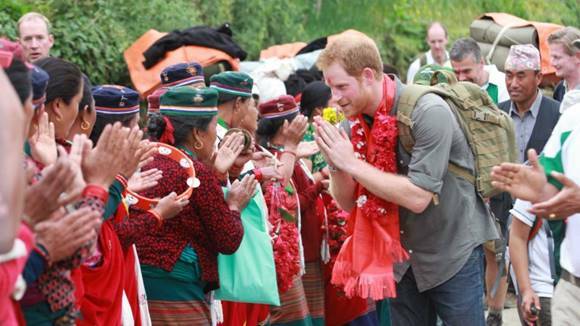 International disaster relief agency ShelterBox has a connection with HRH Prince Harry centred on Nepal. He is, of course, known as the action Royal, famed for his interventions on such humanitarian issues as disadvantaged children, wounded ex-servicemen and women, the AIDS orphans of Lesotho, land mines, mental ill-health, and conserving Africa’s communities and natural heritage. But it was his army career, as an officer serving in Iraq and Afghanistan, that forged his comradeship with the military, and inspired the Invictus Games. Prince Harry was the first member of the Royal Family to serve in a war zone since the Falklands War. In May 2015 ShelterBox Response Team member, Jimmy Griffith, was invited to Auckland’s Government House as part of Prince Harry’s first Royal tour of New Zealand. He was among representatives of emergency service and disaster relief organizations at the Governor’s Reception. The Prince had flown in after a month’s training with the Australian armed forces. We are so pleased that this evening’s event will benefit … ShelterBox, in recognition of their work providing emergency response and resilience building in Nepal following the earthquake. The proceeds of ticket and brochure sales for the world premiere brought ShelterBox a donation of over $300,000. ShelterBox’s Risk Management expert Andrew Clark, who was also the charity’s Nepal in-country coordinator following the earthquakes, was later invited to advise Prince Harry’s team at Kensington Palace ahead of his Royal visit to Nepal in 2016. In a busy tour of Nepal, Prince Harry met young people to talk about their challenges and opportunities. ShelterBox had distributed SchoolBoxes to Nepal’s orphanages, each containing education equipment for fifty students. A ShelterBox tent had also been given to a local children’s art therapy organization to create a fun, friendly environment where children could overcome the trauma of the earthquakes. The Prince also visited Kanti Children’s Hospital in Kathmandu, where he met injured child patients. After the earthquakes in April 2015, the immediate use for ShelterBox tents already stored in Kathmandu were as outdoor clinical spaces for damaged hospitals. Prince Harry is respected by the world as someone who has used his privilege to highlight important causes, which is to be admired. We are pleased to share a common interest with His Royal Highness about Nepal. The smaller photos above are free to use in the context of this press release. Please credit © ShelterBox. Captions (L to R) Prince Harry alongside Jimmy Griffith at the Governor’s Reception in Auckland NZ May 2015. 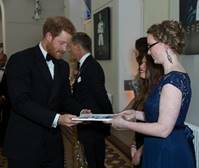 Young ShelterBox intern Grace Howarth presents Prince Harry with a souvenir brochure for the Royal Film Performance at the Royal Albert Hall in October 2015. 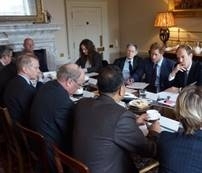 A meeting at Kensington Palace with ShelterBox’s Andrew Clark (left, head of table) before Prince Harry’s Nepal tour in 2016.